I don’t know what happend to me and Easter this year. We’re still a few weeks out, but I just wasn’t in the mood. I guess I just have too much going on. But I decided that was a terrible attitude to have when your kids are supposed to be looking forward to a fun family event. So, I decided to MAKE myself get in the mood. And I started by making some Easter Peeps S’Mores Crack Bark. Love. It. Best way to start Easter. This is such a simple recipe, but it really sets the tone. 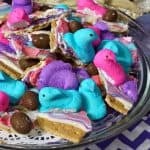 I mean, it’s got creme eggs (a must for any good Easter dessert recipe) and it’s got Peeps–which, right there is a kind of duo that really makes my day. Is there a special candy that just screams “Easter” to you? I dare you to add it to this bark. Heh. There’s a video, for those of you who would run with scissors or drive without a map…heh. 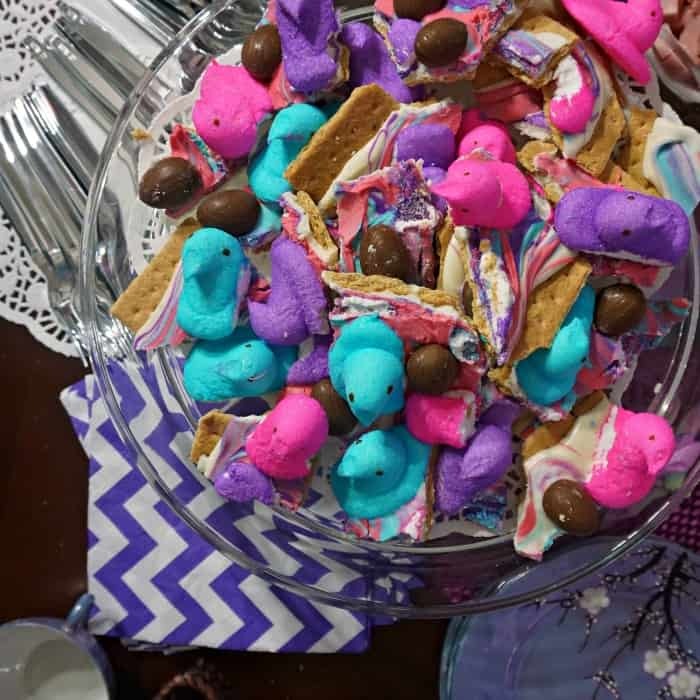 I love how easy this recipe for Easter S'mores Crack Bark is! 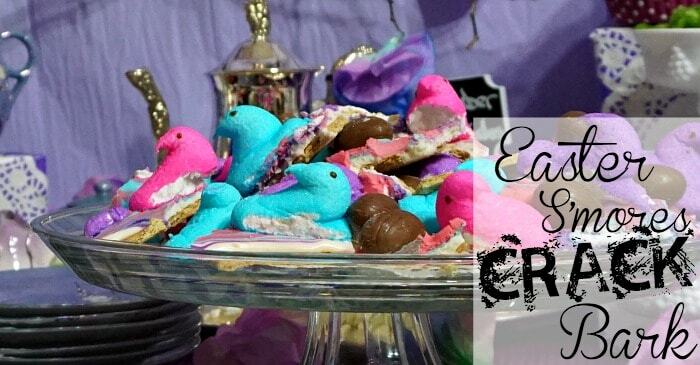 Takes about 15 minutes to make--and then you have the perfect Easter treat! In 30 second increments, melt the chocolate in the microwave. Stir chocolate until smooth. Set aside. Lay graham cracker squares side-by-side on a cookie sheet or baking sheet. Pour 3/4 of the chocolate over the graham crackers and spread evenly with a spoon. Divide the remaining chocolate into 3 bowls, adding 5-10 drops of each food coloring to the respective bowls. Stir until the color is even throughout each bowl of chocolate. Drizzle one color of the chocolate over the graham cracker and chocolate, then the second and then the third, smearing it, if desired (I desired). 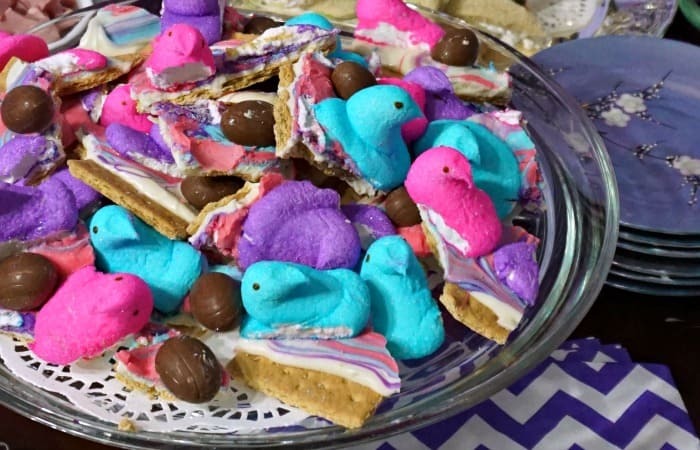 Break apart the Peeps and smoosh randomly into the chocolate. Smoosh the mini-creme eggs into the chocolate randomly between the Peeps. Break bark apart and provide to your little Easter bunnies for prompt devourment. LOL! So, what do you think? Ready to dive-in an give this bark a go? Not so hard, huh? Give a shout-out if you do. I’d love to hear how it turned-out!